Lifeboat volunteers encountered challenging conditions off Skye on Wednesday. RNLI Portree went to the aid of a crew of a fishing boat after the vessel broke down in high winds and rough seas. 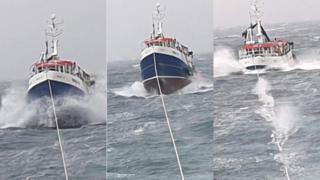 The lifeboat crew took the photographs, with the skipper's permission, of the fishing boat while it was under tow. The broken down vessel was safely taken to Portree pier at about 16:40. How do you kill a 'zombie rumour'?